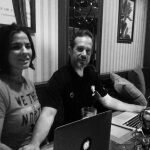 In the 6th installment of ‘4 X Mindfulness’, Neila and Andy record this episode live at Blue Mountain Ski Resort in Collingwood, Ontario, Canada. Neila shares specific strategies related to mindful walking and hiking that are immediately applicable in your own environment wherever it is you may live. As well, she also shares an excellent breathing strategy (called the ‘stoplight breath’) that helps to reduce anxiety and stress that you may experience while driving. Andy shares a great quote from George Bernard Shaw that has to do with the illusion that communication has taken place when it really hasn’t. Embedded within this quote is a powerful message about how to be better communicators and listeners. Andy also shares a story about Neila that is funny, but also contains a valuable lesson about the possibility of impacting others, who we least expect, in very positive ways. We hope you enjoy our 6th episode of 4 x Mindfulness. Neila Steele and Andy Vasily are international educators who have worked at fully authorized IB schools in 4 different countries over the past 16 years (Japan, Azerbaijan, Cambodia, and China). Andy is a consultant, workshop leader, presenter, and speaker. Neila presents and leads multiple workshops in the area of mindfulness. They have devoted themselves to sharing the powerful effects that mindfulness has on promoting greater mental, social, emotional, and physical well-being.